she adores: Chocolate Play dough!!! Need a quick and easy last minute gift for a child? I needed something special to give to the students in my Nursery class at church. 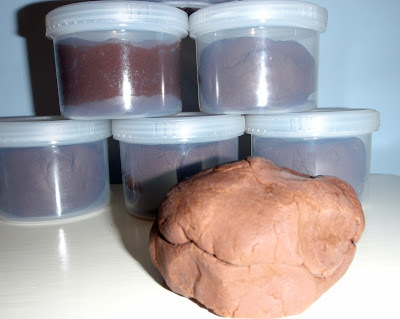 They love playing with the normal homemade play dough each week so i decided to make them their own play dough, but with a twist. I also gave them a set of cutters and roller each and put it all into individual gift bags...too easy. 1. Place all dry ingredients in a medium size saucepan - mix. 2. Add wet ingredients and stir. 3. Stir over low heat until the mixture thickens and forms a ball of dough. 3. Remove from saucepan, cool slightly, then knead until dough is smooth and even coloured. 4. Store in an air-tight container in a dry cool place.